The 2014 Spanish NFPA 780 responds to industry developments with added coverage of new topics to increase protection against dangerous lightning hazards. Fully updated to reflect the latest protection methods, devices, and safety challenges, the 2014 NFPA 780: Standard for the Installation of Lightning Protection Systems is essential for designers, installers, insurance professionals, AHJs, and anyone responsible for protecting lives and property from fire and related dangers associated with lightning events. New section addresses the use of fixed metal objects on buildings that have movable or rotating metal components, such as construction cranes, wind socks, observatories/telescopes, traffic cameras, radar dishes, photovoltaic arrays, and opening skylights. 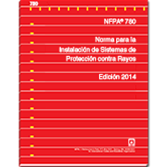 New section addresses retroactivity for the Spanish NFPA 780. New Chapter 11 presents lightning protection criteria and guidance for airfield lighting circuits. Aligned with federal aviation requirements, it provides a thorough look at design and installation of lightning protection systems to afford protection to these open areas. In response to the continuing demand for renewable and alternative energy sources, a new chapter addresses lightning protection systems when solar systems and arrays are provided. The requirements pertaining to catenary systems have been reviewed and significant annex material provided to clarify computations for applications with metal or wood poles.